DREXIT: The Long And The Short Of It | Warped Factor - Words in the Key of Geek. Chris Morley goes to extremes. To stay or to go? 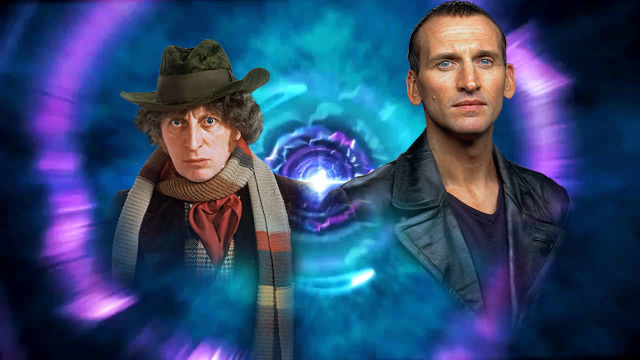 Its a delicate question once so eloquently posed by the Clash, and within Doctor Who it takes on a certain resonance particularly if your name happens to be Tom Baker or Christopher Eccleston! One, of course, holds the record for staying- a mammoth seven years- while the other departed following the 2005 revival of the series. But what can we learn of the pros & cons of such longevity on the one hand, and a perceived lack of staying power on the other? "I was always happy. I didn't want it to stop." But he would also come to a conclusion some may have reached before him! "Without doubt, Baker made the part his own. Viewing figures went up and many of his stories - The Ark in Space, Genesis of the Daleks, The Brain of Morbius, The Deadly Assassin and The Robots of Death - are regarded as classics." A little affectionate parody hardly hurt either! Fast forward to Doctor Who's triumphant return under the stewardship of Russell T Davies, a man not averse to a bit of Baker. Living a dream, he would give BBC Wales' Julie Gardner a list of his favourite classic series episodes with Tom's trip to Paris for City Of Death at the top. She was suitably impressed. "I didn’t really watch the show, but when I was fortunate enough to take over, Russell gave me a homework list. It was Russell’s favourite episodes. City of Death, for me, the Tom Baker story, I just loved it, and from the moment of watching that story, I thought there was so much we could do with it. It’s so fun, it’s so mad." Fantastic stuff. Our own Tony Fyler notes much the same! "What story from the past would be the keynote for the future? Well, City of Death, obviously. It maps out the 21st century future of the show – in a world before tone meetings, City of Death showed the way." As well as one of Baker's finest setting the template for the revived series of Who, there are many similarities between Tom & Christopher's respective departures than might be first apparent. Much has been made of Eccleston's leaving in the intervening years - the man himself hinting at disagreements behind the scenes without naming names. As part of an appearance on Radio Four's Loose Ends he revealed the discord between himself & those at the top. Whether one of those men was the one who'd cast him after working together on The Second Coming has never been revealed. But did his stand against behind the scenes politics have any impact on the public's view of him as the Ninth Doctor? Peter Davison was certainly critical when it came to the timing of the announcement that his latest successor at the helm of the old police box was handing over the key to a new man. "I don't think you can engage with the new Doctor in the way you should be able to." "I didn't want the costume to be my performance"
It's true that it's hard to imagine Baker without first jumping to the flowing woollen thing around his neck & that ever present long coat. In his performance it's hard not to imagine Chris was thinking of old Tom in going against what he saw as an ever present hint of the fop. Maybe ultimately it's simply the case that both stopped enjoying it & quit while they deemed themselves to be ahead? At least it can quite safely be said that one did a better job of hiding any sign of boredom better than the other, the death of the Fourth Doctor seeming like something of a relief to the man who'd portrayed him, leaping almost gleefully off that radio telescope & relieved to be handing everything, initially including the neckwear which had become a millstone around his neck, over to the aforementioned Davison in time for Castrovalva. With impending death came serenity. "It's the end. But the moment has been prepared for." A few such changes of appearance & outlook had given him the chance to try out a slightly more heroic end. Followed by that fateful kiss as the latest man to play him achieved the 2005-savvy teenage boy's dream of snogging Billie Piper. As were those splendid chaps who went before and after him.